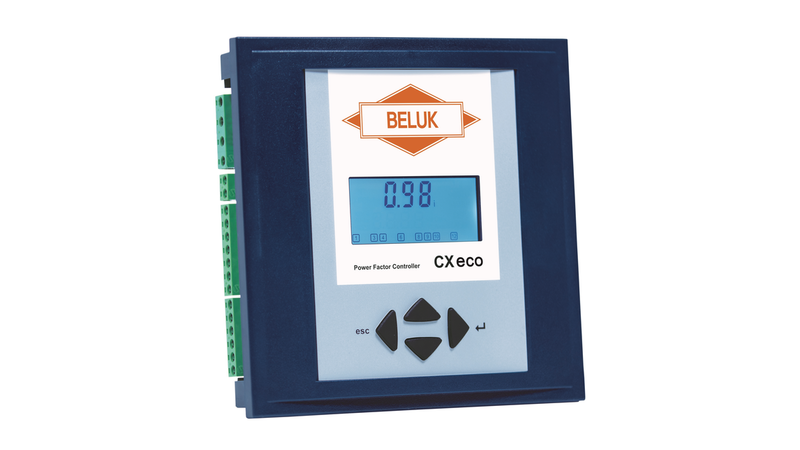 The Power Factor Controller CX eco is based on the CX plus, but the functionality is reduced to basic functions at more economic price. Features like Transistor outputs, Digital input or Modbus communication are not available on the CX eco controller. The well-proven wide-range power supply known from the BLR-CX is also used in the CX plus and CX eco wirh a voltage range of 90 - 550 V AC. The detected capacitor step sizes are verfied and updated during operation so that it is always compensated with actual values. This way the ageing of the capacitores is detected and an alarm is given and the relevant capacitor stage locked preventively when dropping below a specific capacitance. The patented Best Fit Algorithm delivers the best result of the power factor Cos Phi with the lowest amount of switching cycles. When having capacitors of equal size, the switching times or switching cycles are distributed evenly. This extends the life span of the capacitors and contactors, thus saving your investment. The CX eco can have either 6 or 12 relay outputs.